Can Mile Jedinak keep the young guns at bay? BERT van Marwijk has some big decisions looming on some key players ahead of the World Cup in Russia. Here are four of the more pressing issues the Socceroos coach needs to resolve. Massimo Luongo and Tomi Rogic showed against Colombia they have to be in the starting line-up in Russia along with midfield kingpin Aaron Mooy. Could skipper Mile Jedinak, who struggled against Norway and Colombia, find his place in jeopardy? 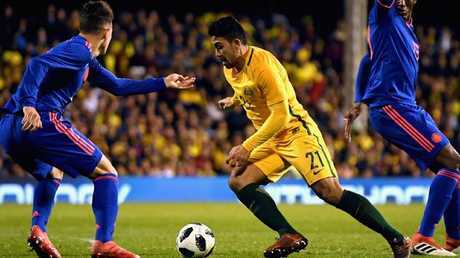 Massimo Luongo was Australia’s best against Colombia. Mitch Langerak's lack of game time with Levante and Stuttgart this season has come back to haunt him with Brad Jones and penalty hero Danny Vukovic now above the former Borussia Dortmund man as the goalkeeping back-up to Mat Ryan. 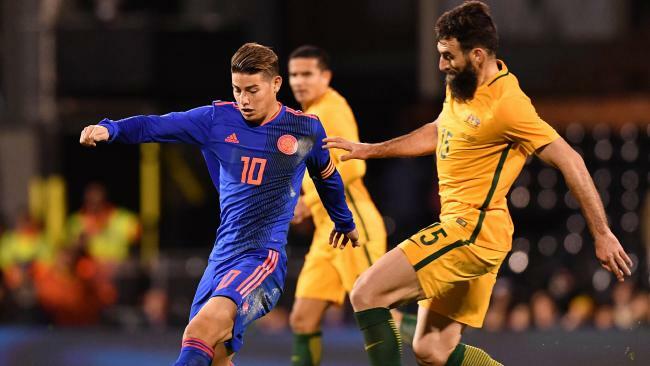 The 0-0 draw against Colombia was deserved, but a more ruthless striker than Miguel Borja would have made Australia pay. Aziz Behich continues to impress at left-back and although Mark Milligan and Milos Degenek were much better against the South Americans, they were exposed by a pacy Norway attack in Oslo. With Tim Cahill not getting much game time at Millwall, the warhorse's knack of scoring in World Cups may not materialise in Russia. Tomi Juric is a decent target man, but far from prolific. More goals will be needed from the midfield with Rogic and Mat Leckie in particular needing to step up.